Page 6. 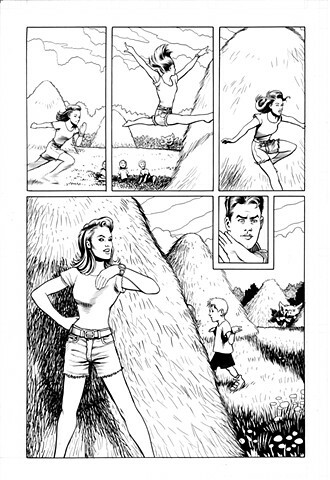 An excellent comics artist named Zach Howard gave me advice on the main figure of this page. She's much more lively than before. Another change was that, since this story was on a farm, I'd picked one of Kimberly's civilian costumes from the show which seemed the most Country, but on drawing her leap I realised that her flying skirt would give the kids much more of an education than she'd bargained for.